Through our expert care, our advanced office, and our caring staff, we will help you not only get back on your feet, but also understand how spine health affects your overall quality of life. 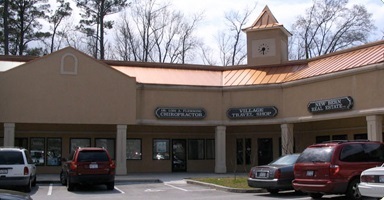 We are conveniently located at the intersection of Trent and Glenburnie Roads in Village Square, right between Carolina Bagel and Milady's Hair Salon. Nothing is more precious than your health! For more information about our chiropractic care call our office at (252) 638-6062. Providing a structured nutritional program to help with weight loss, maintenance or gain based on your individual needs.